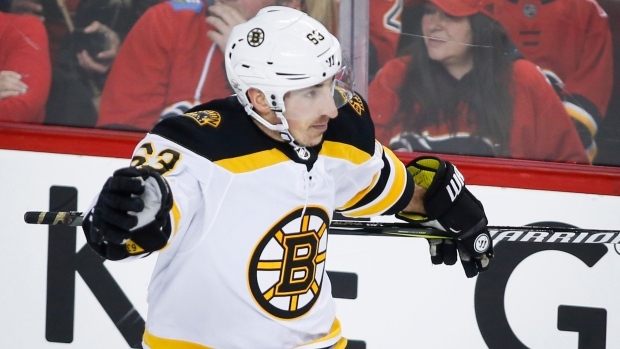 CALGARY — After a blip in Vancouver, the Bruins got right back to business. Brad Marchand's ninth career overtime goal 3:36 into extra time gave Boston a 2-1 win on Monday afternoon over the Calgary Flames. The victory moves the Bruins to within one point of the Atlantic Division-leading Tampa Bay Lightning and comes less than 48 hours after Boston lost to the Canucks 6-1. "We ran into a hot goalie in Vancouver. Their goalie played great tonight. But we were resilient," said Marchand, who has 22 goals on the season. "We were much better in the defensive zone and had a better game overall." After TJ Brodie's turnover deep in the Flames end, Riley Nash's pass sprung Marchand on a breakaway and he made no mistake, slipping the puck through the pads of rookie goaltender David Rittich. "(Nash) made a phenomenal defensive play," Marchand said. "I knew that they had three guys low and I just tried to get out of the zone. He made a great play to get it up." "Tonight was on me," said the Flames defenceman. "I tried to pass to Johnny (Gaudreau). I could have passed it to (Sean Monahan), I could have shot it. It's one of those things that looking back now, I definitely could have done something different." David Pastrnak also scored as Boston (36-13-8) improves to 12-1-2 in their last 15 games on the road. Matthew Tkachuk scored the lone goal for Calgary (30-21-9). "It's frustrating," said Tkachuk, who has 14 goals in his last 22 games. "They're a really good team. Didn't give us many chances at all. The ones that we did get, we've got to capitalize." The Flames, who began the day one point out of third place in the Pacific Division, fall to 1-3-4 in their last eight games at the Scotiabank Saddledome. "It's like any slump, the harder you try, the more you grip the stick, the worse it is," said Brodie. "It's not like we've been playing bad at home, we've gotten chances. It's just one of those things where a bounce here and there, we could be talking about the same record as the road." Meeting for the second time in six days, Calgary was territorially outplayed by a wide margin in the first period but Rittich kept the Flames in it. Calgary tied it 1-1 at 5:28 of the second when Tkachuk banged a rebound past Tuukka Rask on the power play. Rittich was excellent all night with 30 stops. It was his fourth game in a row with veteran Mike Smith (lower body) sidelined and it comes after he gave up four goals on 15 shots and was pulled against Florida in his last start. A minute after Calgary tied it, Rittich slid across the crease to rob Marchand. He later added superb breakaway stops on Ryan Spooner and Pastrnak. "Huge bounce-back for Rittich," said Flames coach Glen Gulutzan. "That team is a hard team to beat. You look across the league, not many teams are beating them. You can't really beat them without goaltending and we got it tonight and it gave us a chance." Rask, who had 28 saves, was also coming off a shortened outing, pulled after giving up four goals on eight shots in the first period against Vancouver. The Bruins have lost only three times in regulation in the last 28 games (21-3-4). "It starts at the top with leadership, and just having that constant belief we can do it, we can get the job done regardless of who we're playing against," said Nash. Notes: Flames D Travis Hamonic played in his 500th career game... Calgary LW Morgan Klimchuk, who was drafted in 2013, made his NHL debut on a line with C Matt Stajan and RW Curtis Lazar. Every player selected in the first round of that draft has now played an NHL game... The Bruins improved to 9-1-3 in their last 13 games against Calgary.